It beneficially reuses a waste stream. It's manufacture uses relatively little energy utilising solar power. Rockstock is a responsible alternative to regular paper made from wood pulp or synthetic paper. Rockstock is a tree free paper that helps preserve forests worldwide that are decreasing in size rapidly. The extensive harvesting of trees is having a deep impact on global climate change. By using ground up waste rock (CaCO3) as the primary content instead of tree fibre, Rockstock replaces a limited and required resource with a superflous mineral, considered as production waste in other industries. No bleaches, acids, alkali, or other potentially dangerous ingredients are used in the production of Rockstock as the paper gets its white colour from the high concentration of Calcium Carbonate which is naturally white. This means that Rockstock does not pollute the air, rivers, and drinking water reserves with any harmful chemicals. "the colour of the paper is the colour of the stone!" The World Health Organisation says the earth's atmosphere should not exceed 350ppm. We are now above 400ppm and rising. Using Rockstock will help to slow the CO2 increase in our atmosphere. 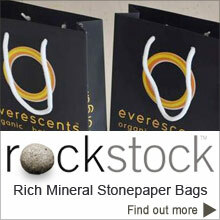 Rockstock now has two product ranges. The Recycled Rockstock range "R-Class" ('R' for recycled) has been developed to run along side our standard "S-Class" ('S' for Sustainable) The R-Class has a high content of recycled stone paper and appears and feels the same as the S- Class. Because growing trees sequesters greenhouse gasses from the atmosphere; harvesting trees to produce wood fibre paper creates a carbon footprint. Rockstocks carbon footprint is further reduced because its manufacture uses approximately less than half the energy of making virgin pulp paper and approximately a third the energy of recycled pulp paper and utilises solar power..
Rockstock uses only electricity for its production. The environmental impact of traditional paper is significant, which has led to changes in industry and behavior at both business and personal levels. With the use of modern technology such as the printing press and the highly mechanised harvesting of wood, paper has become a cheap commodity. This has led to a high level of consumption and waste. With the rise in environmental awareness due to the lobbying by environmental organizations and with increased government regulation there is now a trend towards sustainability in the pulp and paper industry. Rockstock sits well in this regard and minimises or elimates many environmental and sustainable issues associated with pulp paper. Worldwide consumption of paper has risen by 400% in the past 40 years, with 35% of harvested trees being used for paper manufacture. Logging of old growth forests accounts for less than 10% of wood pulp, but is one of the most controversial issues. Plantation forest, from where the majority of wood for pulping is obtained, is generally a monoculture and this raises concerns over the ecological effects of the practice. Description above from the Wikipedia article Environmental issues with paper, licensed under CC-BY-SA full list of contributors here. Community Pages are not affiliated with, or endorsed by, anyone associated with the topic. Rockstock S-Class is a paper made using waste quarry stone, offcut, & waste recycled from the construction industry in the form of unsuitable small rock pieces and broken marble tiles that are ground down to a white powder (Calcium Carbonate). This powder is infused with a small amount of non-toxic HDPE resin to form Rockstock. Rockstock should be recycled through the category 2 HDPE recycling stream. 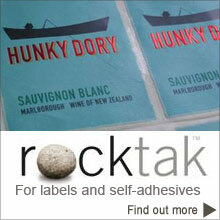 Rockstock is not plastic nor is it pulp paper. This can be easily demonstrated by burning a sheet of Rockstock, which produces a natural chalky residual of calcium carbonate. Because calcium carbonate is used as a filler or strengthener in plastics, it is a useful addition to the category 2 plastic recycling stream and the small amount of PE is therefor in its rightful place. If Rockstock inadvertently enters the paper recycling stream it will be separated and diverted to the category 2 stream or may be burned in a furnace to provide energy without toxic fumes or damage to the furnace. Stone paper is made up of mostly calcium carbonate and a small amount of HDPE. The whole purpose of recycling this product, and the most expensive part of the paper is in fact the PE resin, even though it is considered the minor ingredient! Categorising it in any other number such as 7, or another number that we try to license would mean that it would not be recycled together with HDPE and that would miss the entire purpose of recycling stone paper!!! Resource is very rare, and it is important that stone paper is recycled into the right channel, which is to re-utilize the HDPE content. Please note, it is normal that calcium carbonate (stone) is added to plastics like HDPE, thus recycling stone paper into the plastic stream, specifically number 2 makes most economical and eco-friendly sense! As you may already know stone paper is already being used in the HDPE recycling channels and products as below have been made! Rockstock is also photo-degradable, reverting to calcium carbonate in extended sunshine and the resin is absorbed by the atmosphere without harmful effects. As it photo-degrades (about 12 months for RPD in UV directly from the sun, and 18months plus for RBD) it looks and feels like broken egg shells that continue to crack into smaller pieces until stone powder residue (CaCO3) is left. Rockstock is not Bio-degradable as no insects or organisms are attracted to it to break it down. Tests and a recent thesis also show us that once stone paper is fully photo-degraded there is no resin or 'micro-plastics' left as the already degraded resin oxidises into harmless gasses. Note: Rockstock will not break down in your home or office when kept indoors and away from direct sunlight. Paper that can breakdown properly can let us enjoy both an extraordinary product without having to worry about waste management. Attaining the correct balance to control the speed of breakdown is vital. The good news is, with today’s technology we can attain just that! Because Rockstock is Moth & insect proof and does not yellow it is excellent for archiving if kept away from direct Sunlight. Rockstock can be recycled by converting the used paper back into pellets and then be remade into coloured paper. A New Recycled Rockstock range "R-Class" ('R' for recycled) has been developed to run along side our standard "S-Class" ('S' for Sustainable) This range appears and feels almost identical to the S-Class range except it has a high proportion of recycled Rockstock content. Significantly these various fates for the used product consume significantly less energy and no water compared to that required to recycle wood fibre paper. Furthermore, unlike paper recycling, the process generates no effluent or toxic wastes and ulitizes solar energy. An environmental story of stone paper video above.